Go to original pattern for design DROPS 159-2. Knitted DROPS jacket with lace pattern and shawl collar in "Bomull-Lin" or "Paris". Size: S - XXXL. Bust: 96-106-112-126-136-146 cm / 37 3/4"-41 3/4"-44"-49½"-53½"-57½"
DROPS CIRCULAR NEEDLE (80 cm / 32'') SIZE 5.5 mm / US 9 - or size needed to get 16 sts x 20 rows in stockinette st = 4'' x 4'' (10 x 10 cm). 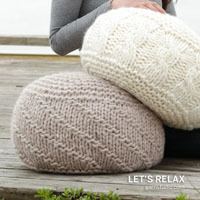 DROPS CIRCULAR NEEDLE (80 cm / 32'') SIZE 4.5 mm/US 7 – for garter st.
You can get the yarn to make this pattern from	48.75$. Read more. See diagram A.1. The diagram show all rows in pattern seen from RS. Band sts will wrinkle inwards when working but lay flat after assembly. Inc 1 st by making 1 YO, on next row work YO twisted (i.e. work in the back loop of st instead front) to avoid holes. 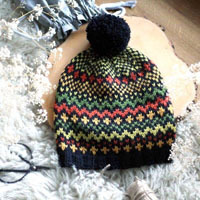 Loosely cast on 185-201-211-235-251-265 sts on circular needle size 4.5 mm / US 7 with Bomull-Lin or Paris. Work 2 ridges in GARTER ST - see explanation above. 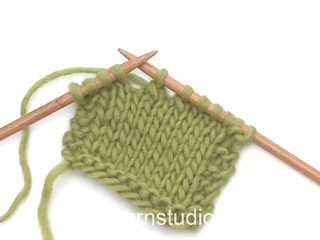 Switch to circular needle size 5.5 mm / US 9, work next row (= RS) as follows: 2 sts in stockinette st, P 1, and stockinette st over the next 26-28-27-27-26-24 sts (= band), work A.1A (= 4 sts), A.1B (= 6 sts) 20-22-24-28-31-34 times in total, A.1C (= 3 sts), work in stockinette st over the next 26-28-27-27-26-24 sts, P 1 and 2 sts in stockinette st (= band). 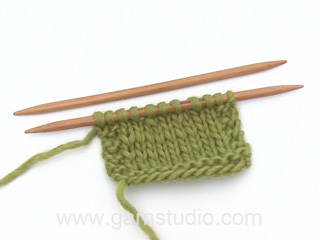 Continue like this - READ KNITTING TIP AND REMEMBER THE KNITTING GAUGE. When piece measures approx. 46-47-48-49-50-51 cm / 18''-18½''-19''-19¼''-19¾''-20'', insert 2 markers; 54-58-60-67-71-75 sts in from each side (= 77-85-91-101-109-115 sts between markers on back piece). On next row bind off 3-4-5-6-7-8 sts for armholes on each side of both markers (= 6-8-10-12-14-16 bind off sts in each side). Now divide the piece and finish each part separately. = 71-77-81-89-95-99 sts. 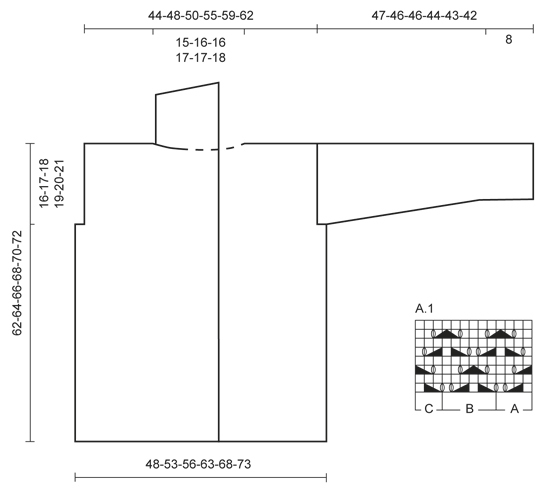 Continue pattern as before with 1 edge st in garter st in each side until piece measures 60-62-64-66-68-70 cm / 23 5/8''-24 3/8''-25¼''-26''-26¾''-27½''. 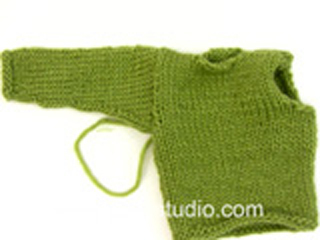 Then bind off the middle 21-23-23-25-25-27 sts for neck and finish each shoulder separately. Continue to dec 1 st on next row from neck = 24-26-28-31-34-35 sts remain on the shoulder. Bind off when piece measures 62-64-66-68-70-72 cm / 24 3/8''-25¼''-26''-26¾''-27½''-28 3/8''. = 51-54-55-61-64-67 sts. Work 1 edge st in garter st towards the armhole and continue with pattern as before, and finish with 26-27-27-27-27-24 sts in stockinette st, P 1 and 2 sts in stockinette st (= band sts) towards mid front until piece measures 62-64-66-68-70-72 cm / 24 3/8''-25¼''-26''-26¾''-27½''-28 3/8''. At beg of next row from RS bind off the first 24-26-28-31-34-36 sts for shoulder = 27-28-27-30-30-31 sts remain for collar. Work in garter st over these sts - AT THE SAME TIME work short rows, beg from WS as follows: * Work 1 ridge over all sts. On next row from WS K 21-22-21-24-24-25, turn and K back *, repeat from *-* until piece measures approx. 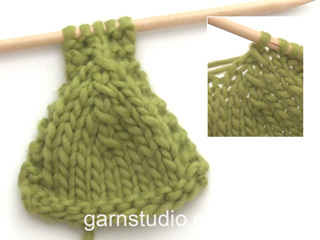 9-10-10-10½-10½-11 cm / 3½"-4"-4"-4 1/4"-4 1/4"-4½"' from bind off for shoulder (short side). Loosely bind off all sts. Work as left front piece but reversed. Beg short rows on collar from RS. Loosely cast on 35-37-39-39-41-43 sts (includes 1 edge st each side) on circular needle size 4.5 mm / US 7 with Bomull-Lin or Paris. Work 2 ridges. Switch to circular needle size 5.5 mm / US 9, work next row (= RS) as follows: 1 edge st in garter st, 1-2-0-0-1-2 sts in stockinette st, work A.1A (= 4 sts), A.1B over the next 24-24-30-30-30-30 sts (= 4-4-5-5-5-5 times), A.1C (= 3 sts), 1-2-0-0-1-2 sts in stockinette st, finish with 1 edge st in garter st. When piece measures 8 cm / 3 1/8'', inc 1 st inside 1 edge st in each side - READ INCREASE TIP above, work the inc sts in pattern. Repeat inc every 4½-4-3½-3-2½-2½ cm / 1 3/4"-1½"-1 1/4"-1 1/8"-7/8"-7/8" 8-9-10-11-12-13 more times = 53-57-61-63-67-71 sts. When piece measures 45-44-43-40-39-37 cm / 17 3/4"-17 1/4"-17"-15 3/4"-15 1/4"-14½", insert 1 marker in each side of sleeve (for assembly). 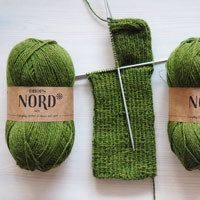 When piece measures 47-46-46-44-43-42 cm / 18½"-18"-18"-17 1/4"-17"-16½" (shorter measurements in the larger sizes because of wider shoulders), bind off all sts. 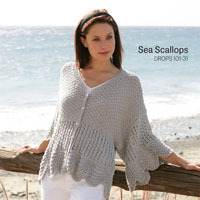 Sew shoulder seams and sew in sleeves in outer loops of edge sts. Sew the sleeve seams in one inside 1 edge st - NOTE: Section worked after marker at the top of sleeve should fit the bind off for armhole. Sew band tog mid back and sew band to the neck egde - NOTE! Seam should be at the back so that is is not visible when collar is folded down. Lightly steam the band with iron, it will then be flat. Bonjour Christelle, cette vidéo montre comment tricoter les diagrammes (pour un autre modèle, mais la technique est la même): au 7ème rang, tricotez les 2 dernières mailles de A.1A(A.1B) avec la première maille de A.1B(A.1C). Bon tricot! Hello love this pattern. Although I am new to diagram knitting. In the body section I’m guessing you follow the whole diagram until the body piece measures out to the length you want? And when it says to slip st as if I, k2 tog psso? You do both right? Muchas gracias por la aclaración, he entendido lo de las filas acortadas. Me gusta mucho este patrón, yo soy más de crochet xq el punto normalmente me aburre pero reconozco que hacer punto con calados me encanta. Hola, estoy intentando hacer el cuello en los delanteros pero no entiendo lo de las filas acortadas: tengo 30pts en la aguja, si trabajo 24pts que hago con los 6 restantes? Los cierro o se quedan hasta el final en la aguja? Cuando dice repetir, que quiere decir: que continúe hasta el final con 24pts? o que siga reduciendo 6 pts cada pliegue? Hola Mariangeles. Cuando se trabajan filas acortadas, los puntos que no se trabajan en la fila se dejan en espera, estos puntos se trabajan en la siguiente fila por el lado derecho. Trabajamos una ida y vuelta con todos los puntos del cuello y una ida y vuelta solo sobre los 24 puntos ( para la talla XL). Así repetimos en modo alterno hasta alcanzar las medidas necesarias. Halo, es ist eine wunderschöne Jacke. Leider verstehe ich nicht wie ich vorletzte Reihe von dem Diagramm in Teil B wiederholen soll. Die 6 Maschen (Teil A.1.B) verlaufen über die Symbole, die hinaus in Teile A und C laufen. Wie mache ich das? Liebe Frau Smieja, dieses zeigt wie man so ein Lochmuster strickt (Diagram ist etwas verschieden aber Lochmuster ist das gleiche). Viel Spaß beim stricken! Bonjour Mme Lebigot, à 46 cm vous rabattez (sur l'endroit) 3 m de chaque côté des marqueurs soit 6 m pour chaque emmanchure: 51 m pour le devant droit, rabattez 6 m, tricotez 71 pour le dos, rabattez 6 m, tricotez les 51 dernières m du devant gauche. Continuez ensuite en allers et retours en commençant sur l'envers et continuez le point fantaisie comme avant, avec pour le dos, 1 m lis au point mousse de chaque côté. Quand vous reprendrez les devants, reprenez sur l'envers et continuez le point fantaisie comme pour le dos (notez le dernier rang tricoté pour que le motif se suive bien comme avant). Bon tricot! Bonjour, ces augmentations se font tous les 4½-4-3½-3-2½-2½ cm, cela vous facilitera votre travail. Il faut tricoter ces augmentations en point fantaisie: pour la premiere fois, au debut du rang vous faites 1 maille endroit (derniere maille du diagramme A.1). Bon tricot! Hej Linda, Du skal fortsætte mønsteret på den pind du er kommet til i diagrammet, den eneste forskel er at kantmasken i hver side strikkes i retstrik. God fornøjelse! Hej Nina, Kan det vara för att få mönstret till att gå upp... ? Eller så tycker jag bara du skall sticka samma antal m slätst som tidigare. Lycka till!